If you want to keep up-to-date with our Reseller program, you can subscribe to our eSource newsletter. It discusses new promotions, product offerings, and more to give you a clear view of changes and developments to your business. 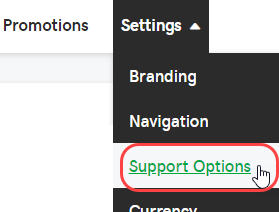 Click Settings and then select Support Options. Under the Contact Preferences heading, enter your preferred email address. Check the box to confirm Yes, alert me of event notifications and important updates. Note: When you select this option, you will also be getting emails to notify you when your customers purchase NEW products from your storefront. Or create custom promotion codes for your customers. You can customize your storefront by using a custom domain.